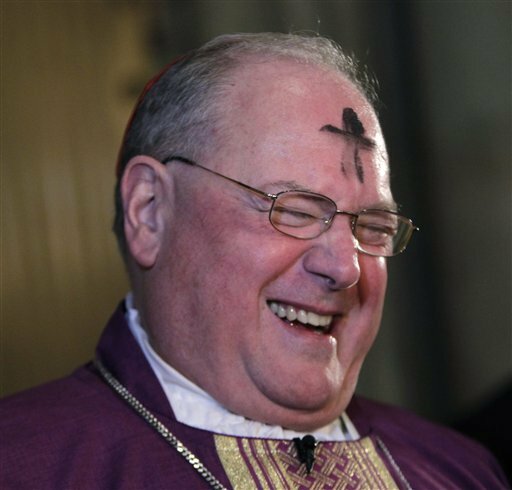 Archbishop Timothy Dolan, in his role as head of the United States Conference of Catholic Bishops, has just issued a directive for all parishes to include the following anti-gay message into every Sunday bulletin. There's so much to unpack here it's depressing. Calling a marriage equality ruling for gay rights the 'Roe v. Wade' of marriage is to freight it with an entirely unrelated and objectionable stigma that's intended to impassion the faithful. This is Barnum & Bailey theology, it's an appeal to your worst nature, not your best. I'd suggest the Archbishop should be ashamed of himself but his language is shameless. The message from Archbishop Dolan goes on to call for prayer, fasting and personal sacrifice to achieve the goal of keeping gay couples from enjoying legal equality with other married couples, and then it urges parishioners to take political action by joining the church’s anti-LGBT 'Fortnight for Freedom' events leading up to the 4th of July. I'm not sure how Archbishop Dolan plans to keep the church's tax exempt status whilst building increasingly public political platforms and coalitions? Just not in gay love. Gay people can be friends, they can not found sexual relationships and they should never ever marry. That's the lonesome love on offer from Archbishop Dolan. But fundamentalism of this type, which claims to be brimming with love as it seeks to strip the rights of a minority, is nothing but an invitation to bigotry. In the last month violent attacks against gay men in Manhattan has spiked with a violent incident every week, including the point blank shooting death of 32 year old Mark Carson. No one 'shared the truth with love' in any of those attacks and Archbishop Dolan has not said a word in condemnation. Not one word. I'm not surprised, he may find it impossible to speak out of both sides of his mouth.